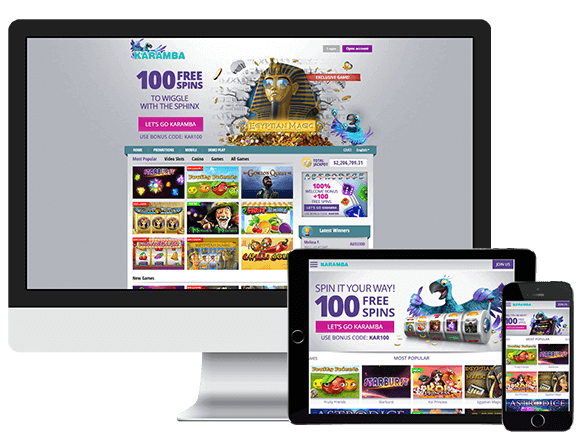 Karamba is a well-established online gambling platform and it has stood the test of time since 2005. They are owned and operated by ASG Technologies Limited to the British Virgin Islands. Karamba has an appealing theme of a blue and purple Parrot mascot. The casino provides players with exclusive video slots among other game variations. As a way of ensuring that they only offer high-quality games, Karamba has partnered with reputable software developers in the industry. The developers use cutting-edge technology to ensure that the games are compatible with different platforms including mobile phones like Android, Blackberry, iOS, and Windows. You will be spoilt for choice with interesting games from giant developers like Aristocrat, Net Entertainment, Amaya, NextGen Gaming, QuickSpin, and Cryptologic. One good thing is that the games are available in instant play mode. Slots: Mighty Sphinx, Legacy of Egypt, Archangels Salvation, Twin Spin, Thunderstruck II, Rainbow Charms, and The Sand Princess. If you find online casino games boring, you can shift to the live section where you will play against real human dealers via live stream. All games are available for mobile users too. Popular live dealer games include Roulette VIP, French Roulette, Blackjack VIP, Baccarat Live, Immersive Roulette, Baccarat Squeeze, Live Auto Roulette and Blackjack Live. Fun at Karamba casino does not just end at the live dealer section, there are multiple jackpot games with numerous opportunities of winning big. You will be thrilled by titles like Jungle Jackpot, Jackpot Jester, and Wish Upon the Jackpot. There are a handful of bonus offers for new players and experienced gamblers. There is a welcome bonus of 100% match up to $200 plus 100 free spins and promotions like Knockout Games. You don’t have to worry about security at Karamba as the site is secured with 128-bit SSL data encryption technology. The casino also holds a license from Malta and the UK Gambling Commission. 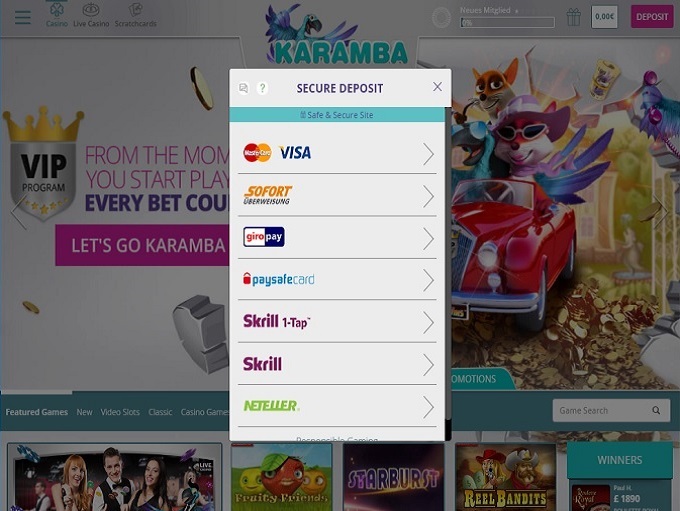 Karamba accepts the following options for depositing and withdrawal Visa, Mastercard, Ecopayz, Neteller, Skrill and Bank Transfers. There is a reliable support team at Karamba which can be accessed between 08:00 and 01:00 via email, phone call, and live chat.